The entrance to our wonderful store at the corner of Colfax Avenue and Grant Street. In Denver for the Association of Writers and Writing Programs (AWP) conference this week? Need something else to occupy your time in between the conference presentations? Want to get a real sense of Denver literary history? Then come to Capitol Hill Books, located at Grant and Colfax and only a short walk from the conference at the Colorado Convention Center. Clicking here will show you exactly where we are located. 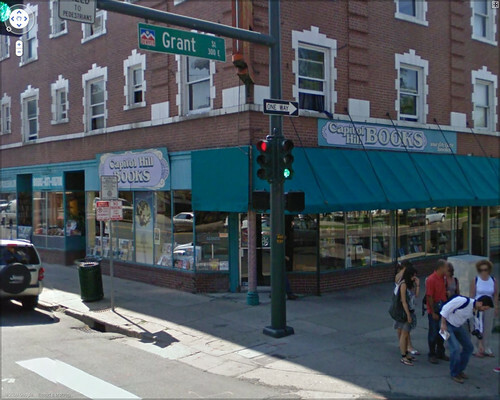 Capitol Hill Books is a literary institution in Denver, located at the same Colfax corner for more than 30 years. We love writers and readers of all types and enjoy finding the perfect book for our customers. We have Denver’s largest database of used books right on this Web site, so you can see what we carry before you make the trek over here. Best of all, all AWP conference attendees get a 10 percent discount for any purchase at the store. Just provide some type of identification from the conference before we ring up your purchase. We look forward to seeing you soon. This entry was posted in Uncategorized and tagged AWP conference, Capitol Hill Books, Denver, Denver literary history, discounts. Bookmark the permalink. Sir, I have about 2,000 Native American books that I am selling. I am willing to take 45% of the price on Amazon. Most are new.